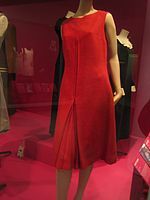 She was one of the designers who took credit for the miniskirt and hot pants and by promoting these and other fun fashions Mary Quant encouraged young people to dress to please themselves and to treat fashion as a game. In recent fashion there are three: Chanel Dior and Mary Quant. She became an instrumental figure in the 1960s London-based Mod and youth fashion movements.